Beautiful hotel with first class facilities. Food was fantastic and the choice was overwealming although the wastage must have been huge as the hotel was not full but enormous amounts of food still put out. Set just on the outskirts of Cala Millor which was quiet but not much going on in the town and a bit of a walk to Cala Bona. Entertainment was typical 5* Guests tended just to sit and listen rather than get up and dance. This Hotel must rate as one of the best 5* hotels available and certainly in Majorca.It is a very relaxed friendly atmosphere. The food is outstanding with quality choice and presentation second to none. The staff are wonderful and extremely professional most of them having been there a very long time, which is usually a good sign. Each year we recognise returning guests of various nationalities which is always nice. This year the entertainment has improved enormously offering some very good shows. hi stayed in this hotel last week and thought it was amazing. The pool in this hotel is massive and is brilliant, the food at this hotel is out of this world and i have never seen a better selection of food in a hotel. The hotel itself is situated near the edge of Cala Millor however it is only a 2 minute walk to the beach and a 10 minute walk to the town centre. The entertainment isnt brilliant with a pianist being the highlight. the facilities at this hotel are also marvellous such as sauna,spa,indoor pool. This hotel is absolutely superb. The facilities are excellent and the whole place is spotless. The food at this hotel is second to none. If you like eating well then I would rccomend that you take the Half Board option, - believe me you will not regret it. On the other hand you can take a meal at the Hotel any night and the "All you can Eat" buffet will cost about 27 euros - well worth it! 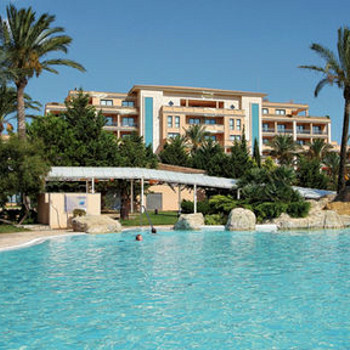 The hotel itself is at the far end of Cala Millor but remarkably is only a 10 minute walk to the centre. Entertainment is not that good, but then again there is a lot available in Cala Millor.